Our premises are located in the heart of the old city of Riquewihr, which is visited by over two million people every year. Access to our cellars and tasting room is only possible on foot. Vehicle access is only permitted for loading and unloading. Our tasting room is situated next door to our cellars. It is open every day, from Easter to Christmas, from 09:00 to 12:00 and from 13:00 to 18:00. Outside this period, it is advisable to contact us in advance. To enable tastings to take place under optimum conditions, a maximum of 8 to 10 persons can be welcomed at a time. Conserved under inert gas, the complete range of "HUGEL" wines can be tasted in the company of our specialists in elegant Riedel® glasses. Some older and rare wines, not on our current pricelist, are also available for purchase, as well as wooden cases and special gift packs. For wine professionals and knowledgeable wine enthusiasts, up to a maximum of 15 persons at a time, a guided tour of our cellars can also be arranged, by prior appointment only (except at weekends and during our harvest). 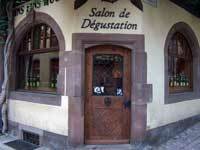 Riquewihr and its surrounding region are full of charming hotels and gastronomic restaurants. We propose the following selection to add to the pleasure of your visit.